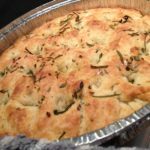 To make typically Italian Focaccia Genovese, you will need some typically Italian, Tipo 00 flour. Tipo ’00’ is Italy’s go-to flour for quick breads like pizza and focaccia, for light cakes, biscotti and gnocchi. In some regions of Italy, it is also used as is, or mixed with semolina durum wheat flour to make egg pasta. We use these Italian flours all the time and have it for you to by at our online store at Pasta Nostra USA. There is quite a bit of confusion over what flour is what and one of the reasons for this is that Italian flour is graded by color, also referred to as ‘extraction rate’. This basically means that flour graded ’00’ is ground very fine and is therefore white, whereas 04 is more like whole meal flour. As a comparison, other countries grade flour by both color and gluten content. These flours typically have names like ‘strong’, ‘plain’ and ‘all purpose’. Combine the water, salt and olive oil until the salt is dissolved. Add this the the mixing bowl first. Now add ½ of the flour to the mixture and mix until combined. Add the yeast and mix for up to 3 minutes until combined well. Now add the rest of the flour and mix until you have a soft, floppy, homogeneous dough. Remove the dough onto a clean and very lightly floured surface and quickly form into a smooth-topped ball which will relax and begin to spread – which is perfectly O.K..
You you need an everyday, shallow oven tray, the sort used for placing under the broiler, or 2 8″ baking pans. Pour half of the extra virgin olive oil in the center of the tray. Place the dough in the center of the oil brushing some of it over the top of the dough. 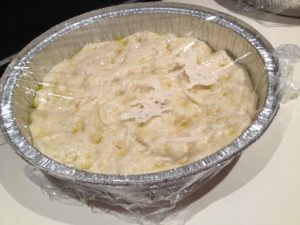 Using the tips of your fingers, begin to gently push and spread the dough towards the edges of the tray until the tray is covered. Make sure that there is oil under the dough as you go. Brush more olive oil on the top if the dough sticks to your fingers. Yes, it is a bit oily but it’s supposed to be like that. Carefully sprinkle the top evenly with the coarse sea salt, chopped garlic and herbs. 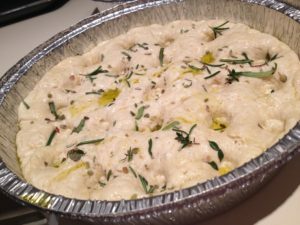 Now set the dough aside to rise for 30 minutes at room temperature (approximately 70 – 86 F). 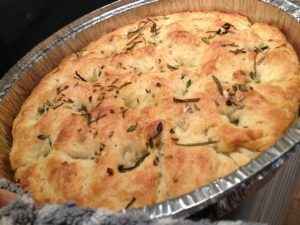 Preheat the oven at 180C/360F and place your focaccia in the centre, baking for 40 minutes. When the bread is lightly browned, remove from the oven and allow it to cool a little in the baking dish before removing and serving. 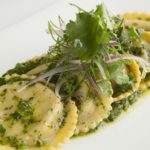 Italian order of service – buon appetito!